Gandhidham, located in the eastern part of Kutch district in the state of Gujarat, is a part of the twin-city of Gandhidham and Adipur. It was established in the early 1950s for resettlement of refugees from Sind Province of the newly created Pakistan. Today, it is considered to be the most prosperous town in the district. It is also the administrative headquarters of Gandhidham Taulka. Consequently, the city is also important from administrative point of view. Gandhidham has been named after Mahatma Mohandas Karamchand Gandhi. Although there is no record of his coming here in his lifetime he was closely involved with the establishment of the town from the very beginning. If you go through our page on History of Gandhidham, you would know that the city owes its existence to a great man called Bhai Pratap Dial Das. He was a great follower of Gandhiji and took his advice on all important matters. The Mahatma advised him to approach the King of Kutch for the piece of land and helped in every possible way. Moreover, Gandhiji was also to lay the foundation of the city. Unfortunately, he was assassinated on the day Bhai Pratap’s telegram inviting him for the foundation ceremony reached Delhi. After the death of the Mahatma, Bhai Pratap brought little bit of his ashes to Gandhdham. A portion of it was immersed in Kandla Creek and the rest were kept in an urn. Later a Samadhi was built around it. Thus, except for Rajghat in Delhi, Gandhidham is the only city, which can boast of a Gandhi Samadhi. Gandhidham is located at a distance of 60 km from the district headquarters Bhuj at the coordinate of 23.0800° North latitude and 70.1300° East longitude. The town has an average elevation of 27 meter (89 ft). The area has a semi arid soil condition and was once infested with poisonous creatures like snakes and scorpions. However, in spite of the semi arid nature of the soil, the area has quite a few water bodies. River Sang, locally referred as the River Saraswati, flows through northern end of the town. Shinai Lake, located at a distance 6 km from the city is another important water body in this area. Gandhidham has hot and semi arid type of climatic condition. The summer season starts in the month of March and extends till the month of June. During this period, the average temperature ranges from 22 degree to 40 degree Celsius. May with an average high of 39.8 degree Celsius is the hottest month of the season. The rainy season in Gandhidham begins in July and ends in September. July, with an average precipitation of 184 mm, has the highest rainfall. The average temperature during this period vacillates around 30 degree Celsius. It begins to decrease from the month of October and becomes really cool from November onwards. January with a daily mean of 18.2 degree Celsius is the coldest. 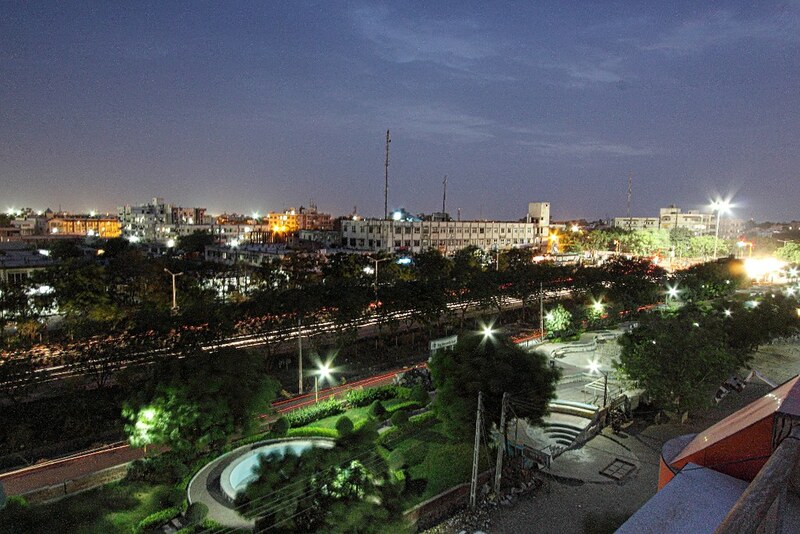 Gandhidham is a planned city divided into self sufficient sectors. Each sector has its own market, shopping centers, hospitals, cinema halls etc. The sectors are next divided into a number of neighborhood wards each of which has its own dispensaries, school and temple. Gujarat State Highway 46 runs from west to east through the middle of the city. Inside Gandhidham it is known as Rabindranath Tagore Road. Most of the important offices and financial institutes are located in areas around this road. GJ SH 141, also known as Kandla Port Road, is another important road running from north to south in the eastern end of the town. The Military Area in the northern part of the town signifies heavy military presence in this area. Gandhidham is mainly a commercial city built to house refugees from West Pakistan. That is why the town does not have too many tourist spots. However, a visitor to the town should never miss Gandhi Samadhi, located in Ward 2A in Adipur region of the town. The IFFCO Colony is another must visit place in the city. The area, with number of parks, lakes and temples, offers a very satisfying experience. The IFFCO Cricket Ground is also located in this region. If you are connoisseur of food, Zanda Chouk is an interesting place to visit in this town. Eateries there offer amazing varieties of ‘golas’. In addition, there are a number of interesting temples located in different parts of the city. Among them we can mention Swaminarayan Temple, Ambe Temple, Gayatri Temple, Ma Asha Purna Temple, Shree Siddhi Vinayak Temple, Shiva Temple etc. In addition, the town has a few interesting tourist spots located in close vicinity. For more details you may refer to our page Tourist Spots in and around Gandhidham.